SNAP Application Form has to be filled by candidates who wish to appear for the exam and want to secure admission in one of the institutes affiliated to SIU (Symbiosis International University). Like any other MBA Entrance Exam, candidates have to deal with a common procedure including registration, filling the SNAP application form, uploading documents and application fee payment. The SNAP Registration process is expected to start from the second week of August 2018. The SNAP 2019 Exam will be conducted in the third week of December 2018. 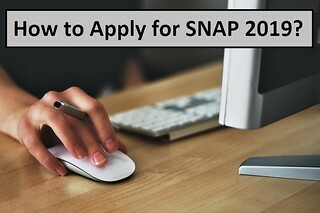 Filling up the SNAP Application Form 2019 is the most essential part to appear for the exam. It has to be filled very carefully if any detail entered by candidates will lead to cancellation of candidature of candidates. Education: Candidates must have a graduation degree from any recognized institute/university. Those who have completed their graduation from a foreign university will have to acquire an equivalence certificate from the AIU (Association of Indian Universities). Score/Marks: Candidates must have passed with minimum 50% marks (for general category) in their qualifying exam. For candidates who belong to reserved category must have passed with 45% marks in their qualifying exam. Foreign Degree: Besides that, it has to be noted that all the foreign degrees certificates must be verified by AIU prior to proceeding for admission in SIU institutes. Candidates will have to visit the official website of SNAP and get them registered first by clicking on the Registration Tab. By clicking on the registration link, a new window will appear on the screen and then read the given instructions carefully and click on "I Agree" button. Personal Details – Candidates will be required to enter their personal details such as Candidates’ Name, Date of Birth, Gender, Contact Details, category, nationality etc. Note: It is suggested that candidates have to provide correct name, email address, mobile number and date of birth as they can’t be changed further once registered. Education Details – In the next section, candidates will have to enter their educational details. They have to enter the qualified bachelor’s degree with marks obtained and with university/ college from where they have completed their graduation and marks secured in Class 10 and Class 12 with recognized University/ Board. Program Selection – After completing educational details, candidates will have to provide program and test preference. Candidates will have to choose the program with Institute carefully from where they want to pursue their masters. Candidates are also allowed to select a single program from multiple institutes. Apart from that, they will also be required to choose the city from the given list from where they want to give their SNAP 2019 exam. Note: No requests for change in exam centres will be entertained by the conducting authority after the payment of the application fees. Uploading Photograph – In this section, candidates will be required to upload a scanned copy of their recent passport size coloured photograph. The format of the image should be .jpg or .jpeg only. The size of the image should be between 10 KB to 100 KB. Please note that the photograph should not be older than 3 months. As per the instructions are given on the official website of SNAP, candidates have to pay the application fees of Rs. 1750/- + applicable charges (gateway) + GST + other taxes. Important: It has to be noted that candidates also need to complete the payment process of the Institutes they wish to go for before the last date of fee payment. Payment will be done through the SNAP website only.